"I felt Plymouth would set me up better than other institutions for a career in the police." Patrick Allen graduated with a first class honours in BSc (Hons) Criminology and Criminal Justice Studies in 2015. Since graduating he has been working as a Control Centre Operator for an emergency careline, volunteering on the Youth Commission and presented the findings of his dissertation at the British Conference for Undergraduate Research 2017. Patrick is now attending the University of Cambridge to study a MPhil in Criminological Research, with an ambition of a fruitful career in public service. "I know it was at the very end but graduation was probably my favourite memory, it was a culmination of all my work and the problems I faced. The Hoe is a gorgeous location and to have all my teachers form a guard of honour to applaud us as we walked out graduates, was an emotional moment for me." "I graduated in 2015, having achieved first class honours. In addition to this, I was presented with ‘The Criminology and Criminal Justice Prize for the Best Dissertation’ and was placed on the Dean’s List. I was also honoured to be invited back to give a guest lecture to a group of final year criminology and criminal justice students on the topic of my final year research as well as give guidance on how to successfully complete a research project. "I had never studied criminology before my time at Plymouth, in fact, I hadn’t ever studied a social science or law previously. However, my father was a police officer for 30 years and my grandfather a police constable for 40 years, so you could say law and order was in my blood. Plymouth has a great reputation for its policing focus and even allows you to undertake the Certificate in Policing Knowledge in your final year. In the very near future, you will be required to have this certificate when applying for a police constable role." "I think going into university there is this opinion that the first year doesn’t matter, that it is just for having fun and you only need to pass it. If I could go back to my first year I would have taken it more seriously, it forms the backbone of your knowledge for the rest of your time at university and your future career. Having looked back through my research, I can now see the theories I could have incorporated into it, ones that I know I would have thought of if I had taken my first year more seriously." "I attended and presented my final year research at the British Conference for Undergraduate Research 2017, which was hosted at Bournemouth University. My research was entitled ‘Legal High Use among Young Adults in the South-West Rave/Party Community: Implications for UK Drug Policy’, and it aimed to determine young adults’ (18-26) current perceptions of legal highs and to assess how this might help government shape current proposed policy and future legislation more successfully. "It found that although participants agreed with scientists on the danger of drug use, they felt the un-researched nature of legal highs meant these posed the greatest risk. They also believe that the risks associated with illegal drug use could be countered through contextual safety and moderation." "The findings also revealed that participants felt drug use was a matter of personal choice, and only a moral issue if their use impacted others. This, they believed, could be countered through moderation. The legality of drug use only affected participants when assessing legal highs, where their loyalty to illegal drugs effectively stigmatised legal substances. "The implications were that, although current proposed supply reduction legislation has been shown to be effective, it is unlikely to impact the drug habits of the South-West rave/party community. Having found that participants were intelligent, moral individuals with their own measures in place to protect the community from their drug use, this research recommended a policy of decriminalisation. However, it noted implementation difficulties in the politically charged atmosphere that dominates policy-making. "If you’re interested in reading my final year project it was published in the Plymouth Law Review, Volume 8. "Conferences are a vital part of a researcher’s career as they allow for the sharing of ideas and research in the scientific community. However, as an undergraduate researcher you are often overlooked for the more qualified postgraduates. Therefore, when I found out that a specific conference had been set up for undergraduates to present their research to their peers, I had to apply as it gave me an opportunity to discuss my ideas and network with the researchers of the future. "I would implore any final year undergraduates to consider presenting either an oral or poster presentation at the British Conference for Undergraduate Research, as it does not only present a unique opportunity but also will be of great benefit to your future career ambitions!" "Since graduating, I have been working as a Control Centre Operator for an emergency careline for the elderly and vulnerable. Alongside this, I have been volunteering at the Office of the Police and Crime Commissioner for Hampshire and the Isle of Wight, on his Youth Commission. The Youth Commission is tasked with conducting large scale qualitative and quantitative research into the views of young people related to four pressing subjects chosen by Youth Commission themselves. The four subjects chosen for 2015-16 were mental health, relationship with authorities, cyber safety and my chosen topic, substance misuse. My role has involved me speaking with young people all over the county, recording their opinions on the topic including, most importantly, their top idea to tackle the problem." "By combining the results of the research with my academic knowledge on the subject, I designed a number of presentations to be used in classes that young people might engage with. It focused on advocating freedom of choice but not freedom from consequence, which I then implemented with the help of my team at colleges, schools, youth offending institutes and universities all over Hampshire and the Isle of Wight. I have also spoken at various county and national conferences on the subject, as well as presenting the strategy to various professional institutions. "If you are interested in reading the Youth Commissions’ report, you can find it at http://www.hampshire-pcc.gov.uk/recommendations2017." "I will always be thankful to the University for the support they provided me throughout my degree." "I had a tough time and had to repeat my first and second year, due to unforeseen medical circumstances. Plymouth always believed in me, despite my issues, and I wouldn’t be where I am without them. "I feel very prepared for a career in the police service, if that is a route I end up choosing. The course’s focus on providing the academic knowledge, along with the practical skills needed when serving as a police officer has put me in good stead if I choose to take that route. 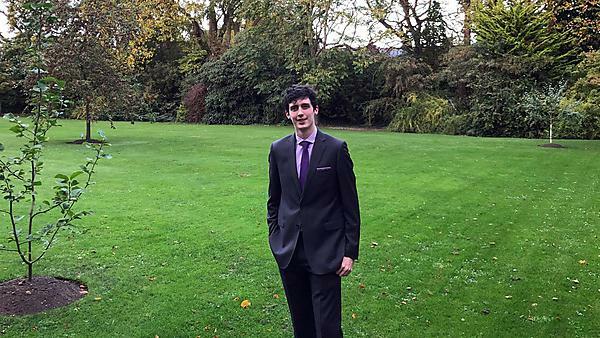 "Plymouth was the right university for me, at the right time. I would recommend you go to the open day and see if it is right for you! In the end, it was certainly an adventure I wouldn’t take back." BSc (Hons) Criminology and Criminal Justice Studies offers you an excellent toolkit of analytical and practical skills to examine how and why people commit crime and how we, as a society, deal with criminality. Whether it’s probation, policing, youth justice, community safety or victim services you’ll develop your critical skills and graduate primed to embark on your future career path.